I have just submitted the first feature update of Rootn Tootn to Apple for review. Hopefully it will be available for download from the App Store in the next week or so. The theme for version 1.1 is “stuff that I didn’t have time for last time.” In addition to a lot of small tweaks, there are three big features: statistics, data export and accessibility. Version 1.0 allowed you to record and view lots of information but there was no way to see it all in context. With this update you will be able to see some statistics, showing what happened on average over the last week and for all time. At the top there’s a graph showing averages for each day of the last week. 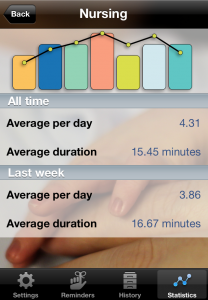 The bars show the number of events (feeds, changes); the line shows the average duration. Press and hold on a day to see the actual numbers. Below the graph are text summaries of the average number of events and the average duration per day for all time and just for the last week. I thought that these would be the most interesting and useful statistics but, of course, you might have other ideas of things you’d like to see. This brings me to the second feature: data export. You can export all the data that Rootn Tootn records as simple CSV (comma separated variable) files that can be imported into most text editing and spreadsheet apps, or even Dropbox so you can open in a “full” application on your Mac or PC. While I’m sure that you can think of other benefits, the two main ones I see are: you can analyse the figures in arbitrary ways that I can’t imagine. And secondly, I don’t want you to feel that Rootn Tootn is holding your data hostage. If you want to get extract it and use it elsewhere, you should be able to do so. The final thing is something I’m not sure I should describe as a “feature,” but is pretty neat nevertheless: accessibility. That’s the name that Apple use to describe the feature, but what does it really mean? In short, it means that partially sighted people can work with apps just as well as those with perfect eyesight. It works by “speaking” the user interface. You can read more about how it works in general here. What I would say is that I have good (albeit corrected) eyesight so I’m not completely confident that I have correctly made every part of the app fully accessible. Please let me know if you find an area that needs work. So that’s Rootn Tootn 1.1: easier to use, better visualisation of your data and the ability to export it. Update: Apple approved it on 30 October.